You have 10 DAYS IN EUROPE – Chart your course from start to finish using destination and transportation tiles. With a little luck and clever planning, you just might outwit your fellow travelers. 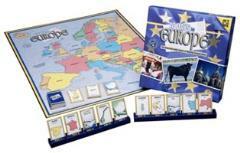 The game contains a Game Board Map of Europe, Destination Tiles representing the countries, and Transportation Tiles for making connections by plane or boat.